. . . and it survived the day uneaten !! Every bride-to-be wants their big day to be special - filled with sentimental memories that will thrill the grandchildren in years to come. What better way to mark one of life's most momentous occasions then, than with a decadent display of baked goods? 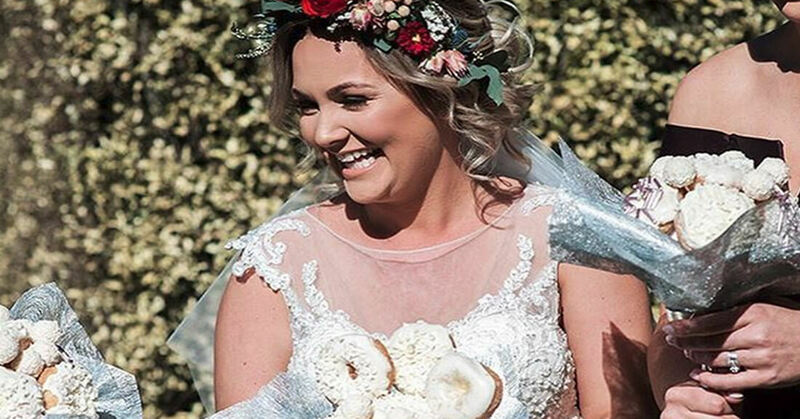 Australian bride Paige Kirk did just that, when she walked down the aisle holding a bouquet of doughnuts, decorated in ivory icing to match her dress, naturally. The 23-year-old opted out of the run-of-the mill bouquet savoir fare, swapping Gardenias for glazed goodies, provided by Dessert Boxes, an Australian company that equip avant-garde brides with a range of themed edible bouquets - including a Batman option. Kirk was the first bride to showcase one of the new company's innovative - and edible - creations. Each of the quirky bride's bridesmaid's sported an ivory bouquet of baked good bliss. However, in an exemplary demonstration of self-control, nobody from the wedding party ate a single doughnut from the bouquet, even after the ceremony. "We had plenty of goodies beforehand so we were too full too eat them," the bride told the BBC. Kirk and her husband Steven had been together for three years before tying the knot in the alternative ceremony. "We wanted the wedding to be a bit different and really reflect who we are as a couple," she revealed. 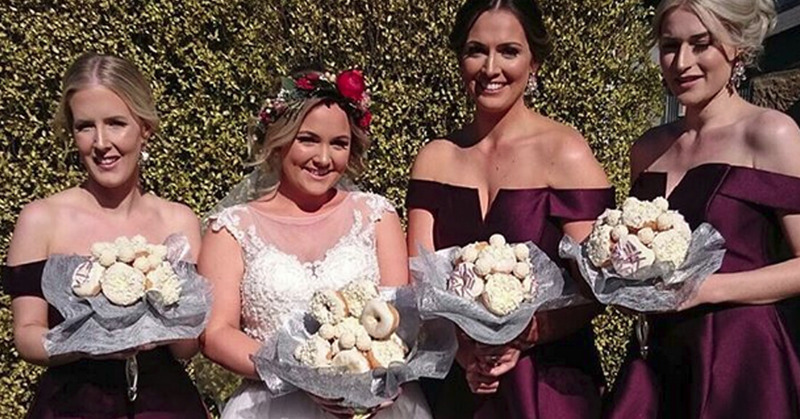 The moment that Kirk revealed to her bridesmaids that they'd all be walking down the aisle holding doughnut bouquets - instead of the traditional floral arrangements they'd originally been given - was filmed by Dessert Boxes and aired to the public in an Instagram live that racked up thousands of views. The video has generated a slew of excitable doughnut aficionados, all desperate to get their hands on the unique bouquet. But, the question on everyone's lips remains: do you have to be a bride-to-be to get your hands on the glazed goodness?